Ambience Ceiling Tile Overlay adds superior noise reduction to existing acoustical ceiling tiles in a lay-in grid. Ambience Overlay products combine absorption with sound blocking properties offered by a one pound per square foot, reinforced mass loaded vinyl (foil reinforced MLV 1#) barrier. Ambience Overlay is available in standard 2' x 4' sizes to drop over existing ceiling tiles. Additional wire support may be required to hold the increased mass of the overlay. 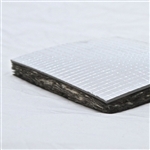 Ambience Ceiling Tile Overlay, CTX-118, 1-1/8" x 23-3/4" x 47-3/4", combines a 1 pound per square foot reinforced, foil-faced mass loaded vinyl (MLV 1#) noise barrier with 1" thick acoustical liner. Supplements existing ceiling tiles with improved sound absorption and sound reduction. NRC 0.80 and STC 28.